It is easy and quick to put together recipe. The only precaution to be taken is that tomato gravy should be sufficient for the amount of rice. In a pan heat the oil in a pan, add the chana dal, urad dal, saute for half a minute. Add fenugreek seeds and coriander seeds and sauté on a medium flame for a minute. Add asafetida powder fry for few seconds, and cook on a slow flame for one minutes stirring continuously. Switch off the stove. Allow the mixture to cool to room temperature. When cool, grind to a fine powder. Keep aside. 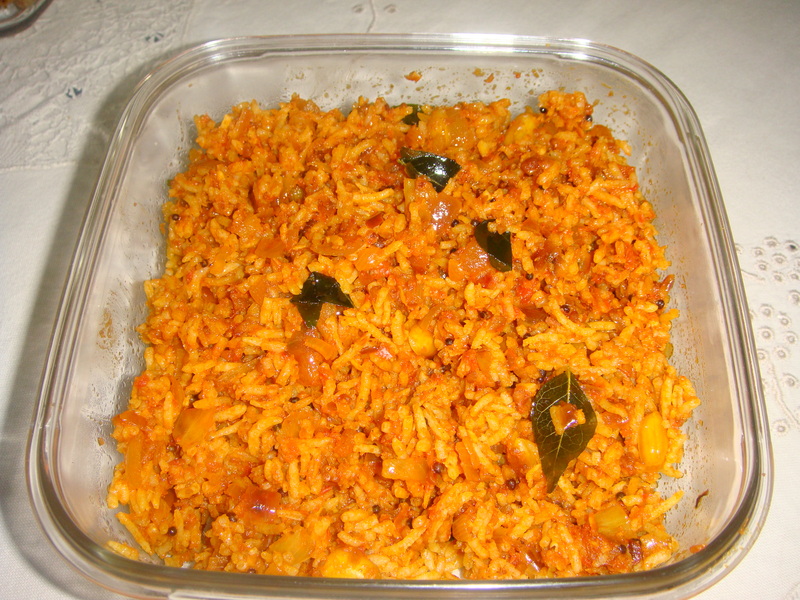 In a pan take the tomato pulp, turmeric powder and salt, mix and cook on a medium flame for three to four minutes, stirring at regular inter wells. Add the prepared masala powder to the tomato pulp, mix and cook on a medium flame for a minute. Switch off the stove , Keep the tomato paste aside. In a deep pan heat the oil and add the mustard seeds. When the seeds start crackling, add the curry leaves and peanuts, sauté on a low flame for few minutes or till the peanuts turn light golden brown in colour. Add the onions, mix well and sauté on a medium flame for another couple of minutes, stirring continuously. Add the tomato paste and 1/4 cup of water, mix well and cook on a medium flame for two minutes. Fold in the rice ,salt in to the tomato paste and mix gently cook on a medium flame for another few minutes, stirring occasionally. Serve hot. Coconut raita / pachadi and papadams make very good accompaniments to tomato rice.